As tensions run high at security checkpoints, US airports are getting creative to ease their passengers’ frustrations. Puppies, mini horses, clowns and musicians have landed at terminals to bring fun moments to massive, not-so-fun TSA lines. 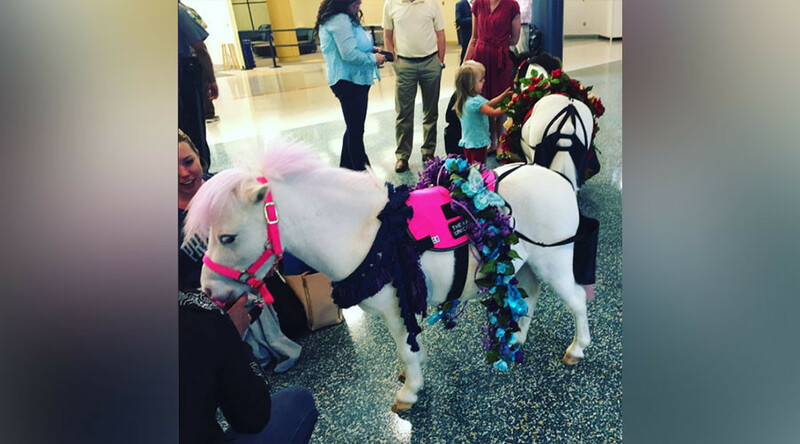 Cincinnati/Northern Kentucky International Airport has resorted to fairy-tale themes, bringing in adorable pink horses, all in collaboration with the Seven Oaks Farm Miniature Therapy Horses program. The horses and their Ohio-based handlers seem to have made it a little easier for passengers to cope with the hours-long lines and anxiety over the past month. However, as of now, the ponies only come twice a month, and their next visit is unofficially scheduled for Monday, June 6. The program was launched a while ago in hopes of making the airport a more welcoming place and to give passengers a reason to smile. “Animals help reduce stress and anxiety levels and put smiles on people’s faces,” Kershner told NBC News. Many other airports across the country have been successfully practicing dog-therapy programs. Meanwhile, San Diego International Airport has literally turned its terminal into a circus by sending in the clowns. Though not originally planned as a distraction from long TSA lines, the Fern Street Circus is trying to improve travelers’ moods with its performances, rehearsals, and workshops. “We certainly think they will be at the checkpoints often, as people waiting in line are a great audience for them!” San Diego airport spokesman Jonathan Heller told NBC. However, people on Twitter do not find the clowns at the airport terribly funny or helpful. San Diego airport adding clowns, stiltwalkers and jugglers to entertain those stuck in long TSA line. Why make the problem worse? According to San Diego International Airport’s website, the performances began on May 11 and take place in the pre-security area of Terminal 2. Airports in Seattle and Atlanta have resorted to more traditional means to chill out passengers who are hot under the collar, such as live music. Sea-Tac Airport has expanded its popular post-security music program to pre-security areas, while Atlanta has added extra performers in the areas before security. The TSA has been urging passengers to get to airports at least two hours before domestic flights and three hours prior to international flights. However, on Monday, nearly 500 passengers still failed to board their planes due to massive lines at security checkpoints.